Little Srinjayee turned 3 on August 5, 2017. She had been waiting to turn 3 so she could go to school and learn new things she could do with the alphabets and numbers she had learned. Instead, the little one spent her third birthday in the hospital undergoing platelet transfusions to keep her alive. Srinjayee was diagnosed with Aplastic Anaemia 2 months back. This means her body cannot produce new blood cells, leaving her fatigued most of the time. Her body is weak and she is being kept alive only on transfusions. The little one has already undergone 5 blood transfusions and over 30 platelet transfusions. She has spent the past two months in various hospitals, absolutely unable to survive without support. Srinjayee’s Father Is A Petty Shop Owner. Srinjayees father, Ashok owns a small bedding store in North 24 Parganas. Due to his baby’s condition, he had to shut the shop to be by her while she undergoes treatment. His monthly income of Rs. 8000 is hardly enough to make ends meet for his family of 5. Now, with his income gone, he has no way to even keep his daughter alive. “When I heard we had to travel to another part of the country for treatment, I gave up. I knew I did not have the money to even save my daughter’s life, but my friends and relatives supported and helped me so I could at least try,” the father admits. But He Wants A Permanent Solution For His Daughter. Ashok cannot watch his little one die every day. He wishes for a permanent solution to her problem. Transfusions are expensive, and he cannot afford it as and when needed. A Bone Marrow Transplant is the only way his baby daughter can live. This will stop the need for regular transfusions and help the little one live a normal life. 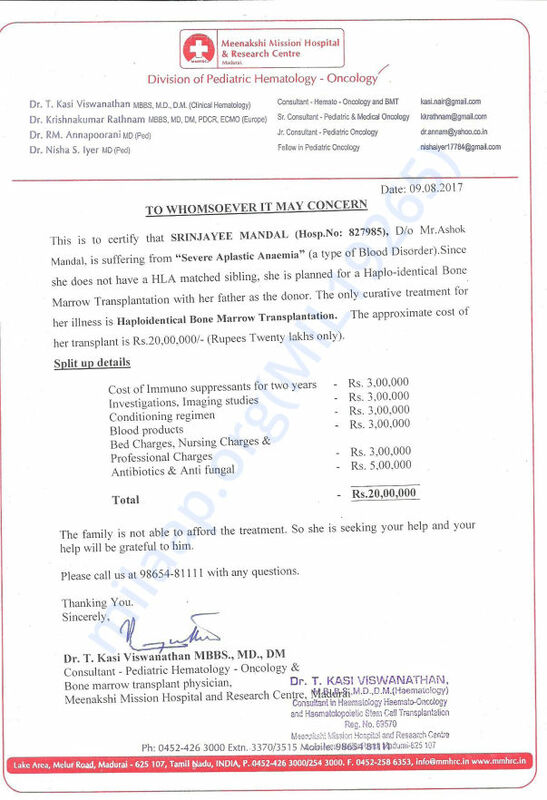 The procedure is estimated to cost the family 20 Lakh. Baby Srinjayee is slowly giving up. She asks lesser and lesser about school and home now. It used to make the little one restless to even think about her friends. She wanted nothing more than to go back home and join school, but now she has become very grim and silent. Regular transfusions at a previous hospital had given her infections. Now, the infection has been cured to a large extent, and a channel has been inserted to ease her pain during transfusions, but her little body is getting weaker and weaker. 20 Lakh is a very big amount for a family with no income. Ashok is compelled to see his little one die a slow, painful death if he cannot help her with the right medical treatment. 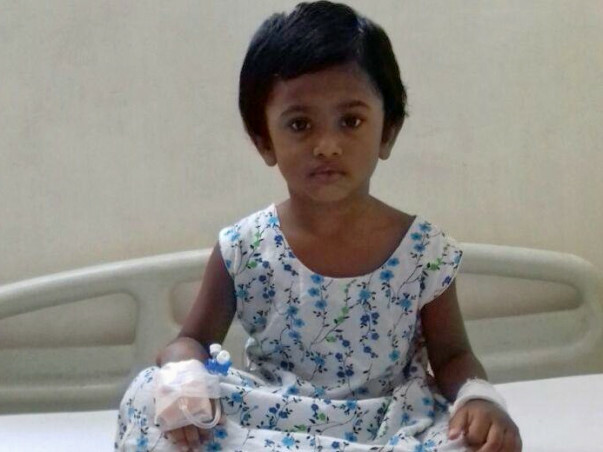 Any contribution made towards this fundraiser will help this father save his little daughter. Srinjayee passed away on the 27th September. Our hearts go out to this brave child who endured so much pain and fought so hard for her life. Your timely support ensured that she received the best medical care. She had been administered chemotherapy, the next step was Bone Marrow Transplant but she did not find a donor. She received the best medical care possible due to your support. She developed severe pneumonia and was on ventilator support. Unfortunately, her body was unable to take the stress and she passed away on 27th September. The family is grateful for all the care and support you’ve shown Srinjayee. The past few days have been the most difficult ones for the family. The funds raised via this campaign have been utilized for her treatment. We hope they find strength in this time of grief. May Srinjayee's soul find peace. Please keep the family in your prayers.